So you need to figure out the date of your Martin guitar. It's actually a lot easier than you may think. Unlike the nebulous web of varying schemes and numbering systems used by companies like Gibson over the decades, Martin has employed a single string of serial numbers for a vast majority of its guitars going all the way back to 1898. This means that just using the serial number of your Martin will give a very accurate date of when the guitar left the line. The Martin serial number sequence starts at 8348 which is how many guitars the firm had estimated it had produced from its inception to when they started the serial sequence at the end of the 19th century. Martin has kept meticulous records of the serial number of last guitar produced each year, so finding the year of production by serial number is as simple as finding the range it falls into the chart below. 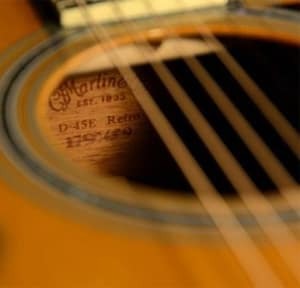 In a vast majority of cases, the serial number on a Martin guitar can be found inside the body near the neck joint. This can be seen by looking through the soundhole on the guitar towards the front of the instrument. It can be a little dark in there, so you may need to use a flashlight (or the glow of smartphone) to read each digit. There are other instances where you may find the serial number of any extant paperwork that came with the instrument. There are a number of exceptions to the above. Most notably, Martin Mandolins from before 1991 use a different sequence than guitars. Additionally, the solidbody electrics like the E18 model from the '70s do not conform to the above. Numbers 900001 to 902908 were used by a short run of Sigma-made Martin models in the early '80s so don't not appear on Martin models.